Let me start off this post by saying I was on a short road trip, and road trips make people do the weirdest things. Sing-alongs to 90s favorites like the boy bands (pick your favorite) and balladeers like Celine Dion. Getting trucks to honk their horns in a most juvenile fashion. Scarfing bags of Cheetos and beef jerky. On this road trip, I didn’t do any of these things. (But I will not vouch for road trips prior.) I did, however, partake of another on-the-road oddity: The bizarrely delectable bounty that is the rest stop fast food court. What is it about rest stop fast food that makes it so much better than fast food at any other time? Is it the diesel fumes of the nearby gas pumps interfering with our taste buds? Or maybe it’s the psychological imbalance that springs from hours in close confines with several other people that sharpens our pleasure senses. You want, no, need, fat, sugar, and salt, pronto! The rest stop blithely obliges. So yes, you are seeing that image correctly. 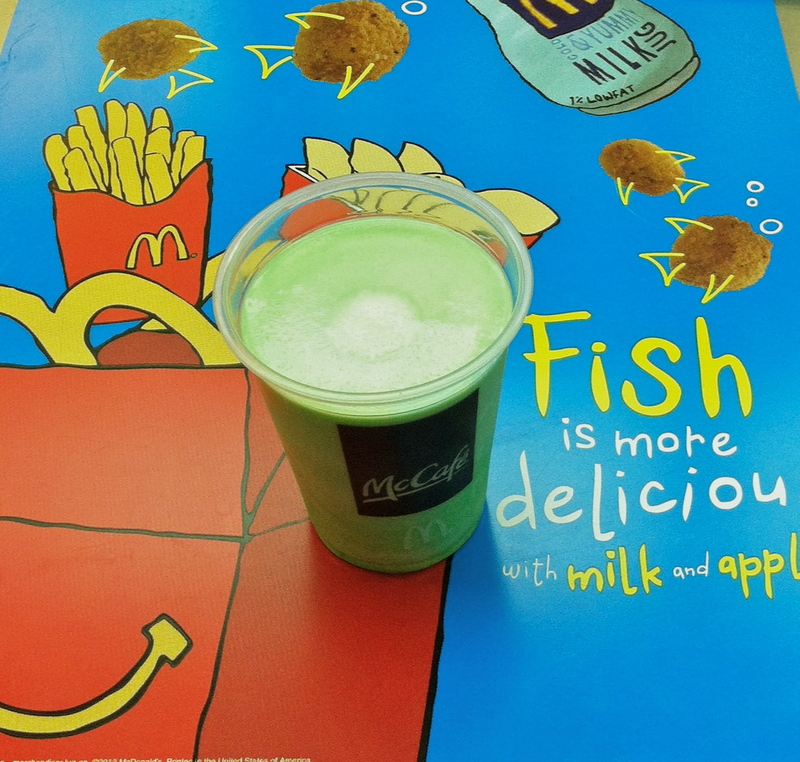 There, situated amongst the flying fish nuggets, is a seasonal favorite from McDonald’s. For those unfamiliar, I present to you the Shamrock Shake. Apologies for last week. It’s all the Christians’ fault. They took me, a lonesome Jewish girl, into their home on Christmas and gave me gifts and fed me ‘til I was stuffed fat as a holiday goose. Between the eating and the sleeping and the chatting and the eating and the napping I completely lost track of time. An old house in suburban Rhode Island, where I was staying with N.’s family, is essentially a vortex where time stands still and a person can forget the day of the week. And so, I neglected to post. But in case you didn’t get the picture, one thing I did plenty of over Christmas was chow down. Most of what I ate was traditional homemade fare – turkey, stuffing, mashed potatoes, spanakopita (Greek Christmas! ), trifle, cheesecake – but N. did take me to a local Rhode Island ice cream joint, Newport Creamery, to enjoy a famed frozen treat with a provocative, intimidating name: the Awful Awful.